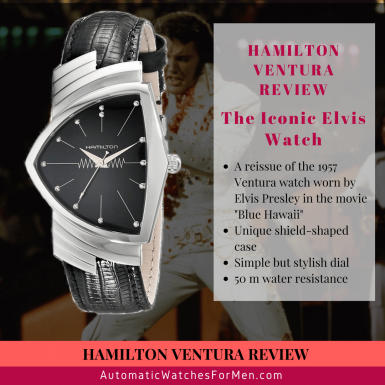 In this post I’m going to write about a very iconic watch in rock and roll – the Hamilton Ventura aka the Elvis watch. It’s not only iconic due to its shield-shaped or V-shaped case, but the fact that the King of Rock and Roll even worn one cemented its status as a one-of-a-kind watch. 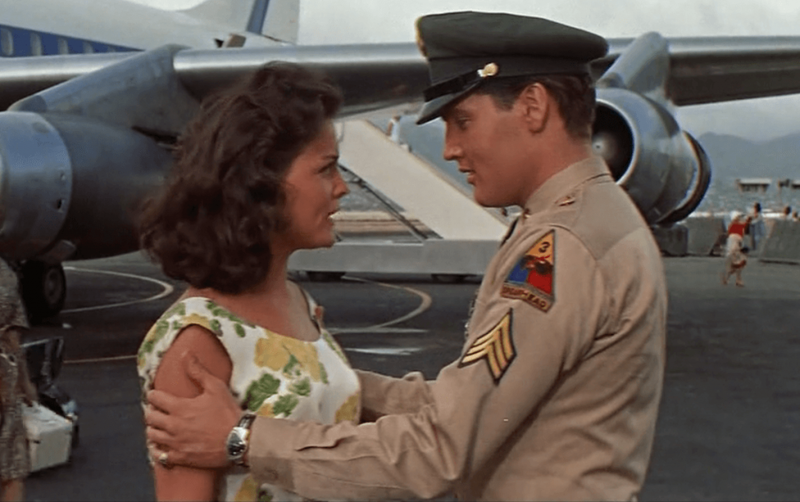 Elvis Presly worn the Ventura in many appearances, but most notably in his 1961 movie “Blue Hawaai”. The King was known to be an avid watch collector, but I believe the Hamilton Ventura is one timepiece that fits him perfectly. Just look at the watch – it’s totally unusualy with the shield-shaped case. Elvis, with his over the top concert outfit and fashion sense, was clearly the rightful owner at the watch. It just seemed that Hamilton designed the watch specifically for him! Not only that, the Ventura that Elvis owned was also one of the world’s first electric watch. Apart from the extraordinary fashion sense, the watch is also a historical landmark from horological point of view. Around the 50s, the world tried to invent a new type of watch to replace the not-so-accurate mechanical watch. 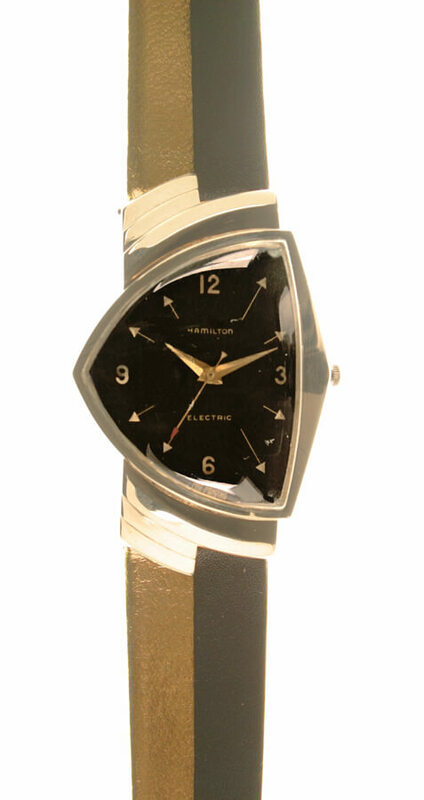 One of the first invention was the electric watch, first emerged as a prototype in 1952. But it was only until 1957 that Hamilton produced the first electric watch produced for the masses, the Hamilton Electric 500. Hamilton then decided to put the same movement into the Ventura, released in the same year. The early electric watch still uses the balance wheel set-up as seen in traditional mechanical watch (read my article here to learn more about how mechanical watch works), but instead of a mainspring, it used battery and electromagnets as power source. While it had the benefit of longer use since the watch don’t need to be winded to recharge its power reserve (like the traditional mechanical watch), the usage of balance wheel as timekeeping device meant the electric watch was not really more accurate than its mechanical sibling. It was not until 10 years later the tuning fork movement (by Bulova) and the superb quartz movement (by Seiko) that mankind finally made a significant breakthrough in horological accuracy. But without a doubt, the Ventura and Hamilton’s other electric watch did made a huge impact on the watch world. It was the first watch to be powered by electric / battery cell and was the foundation of other electric watches were built upon. 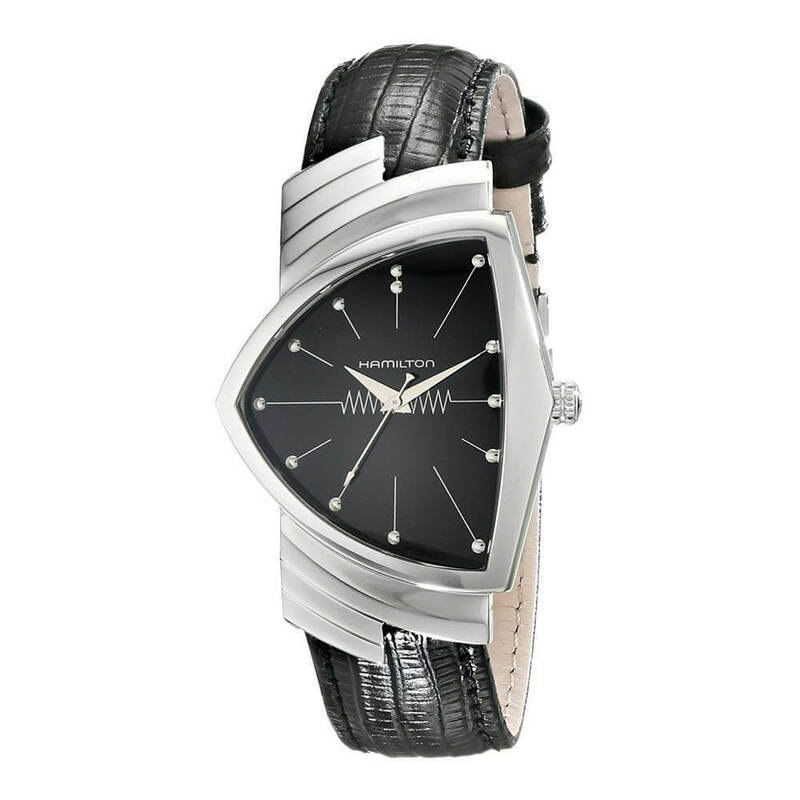 And the Ventura, with the shield-shaped case remain one of the most iconic and stylish watch ever made. Enough with the introduction. Let’s get into the Hamilton Ventura review shall we. 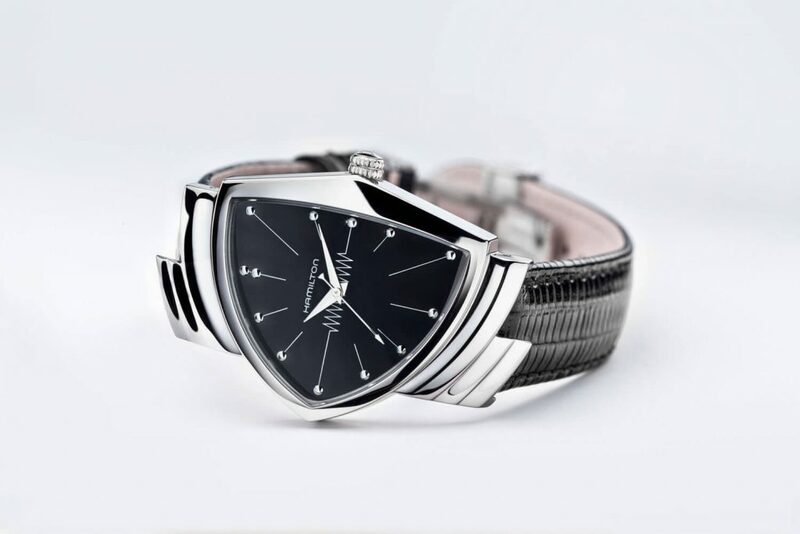 Over the years, Hamilton had released various Ventura watches such as the Elvis80 (released in 2015 to commemorate Elvis’ 80th birthday) and XXL (with bigger size) versions, but this particular model (model No. H24411732) is the one with the closest resemblance to the 1957 version that Elvis worn albeit in silver stainless steel vs. the gold case in the original. This watch has the pitch black dial underneath the clean silver stainless steel hands and markers providing a handsome contrast dial. Is it a bit monotonous ? Yes I agree but I there’s something about the cleanliness of the dial and the overall design of the watch that makes it very unique. While the other iterations of the current Ventura (such as the Elvis80 watches) have open dial design, this particular model looks sharper. Sometimes, less is more and that’s definitely true for both this and the original Venturas. After all, when you got a very unique case, the dial is best to be left as simple as possible to not make the watch too “busy” with lots of elements. Also, it’s actually better in terms of practicality as the V-case doesn’t provide much dial real estate. A simpler design is preferred to ensure best legibility of the time. Besides the small dots as index markers, there’s also the Hamilton signature and the triangular pattern at the middle. Unmistakably, the pattern is a nod to the coil symbol – to commemorate the original 1957 Ventura with the moving coil electric movement. 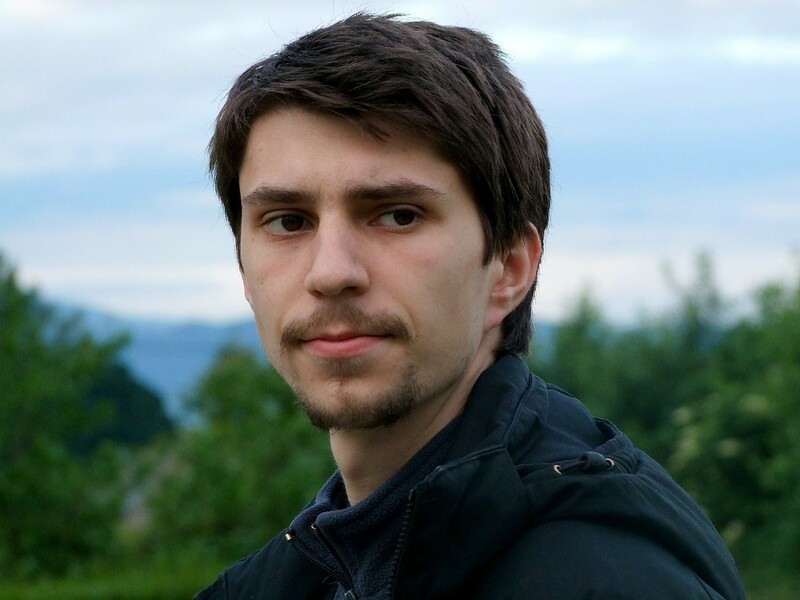 Very simple and yet very handsome. The Hamilton Ventura’s dial is not as eye-popping as other watches but it’s the perfect companion to the V-shaped case. The most attractive element of the Ventura is of course the unique shield-shaped or V-shaped case. It’s almost identical to the original 1957 version with the exception of a slight change in the crown. 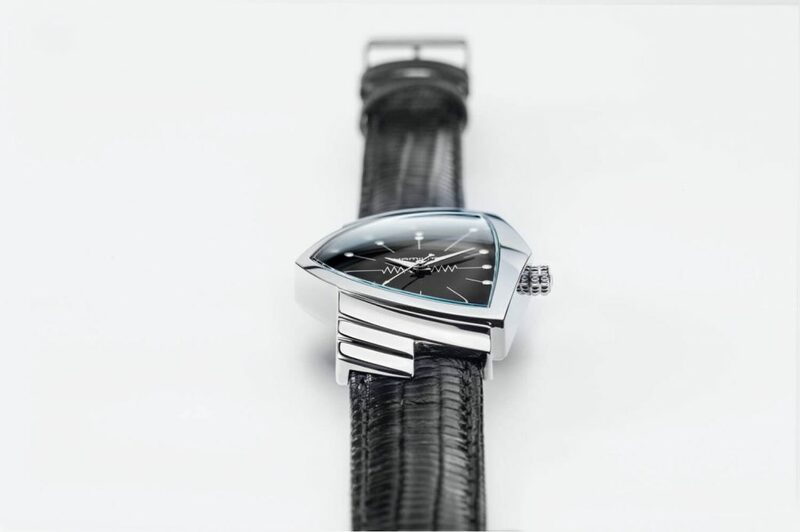 The case has a v-shape with the 9 o’clock positioned at the bottom of the V. The 9 o’clock to the 3 o’clock is the shorter side of the watch at 31 mm. The longer side of the watch (or the top of the shield/V) is at the 3 o’clock side and purposefully made to be perpendicular to the wrist. At the ends are the “wings” that extends out from the watch’s main body to the strap. While the shield-shaped case is the one that stands out the most, the wings are also my favorite bit on the watch. Besides having a practical purpose to hold the strap pins, it amplifies the Ventura’s unique look. A truly remarkable design in my opinion. It’s truly befitting Elvis with his outlandish fashion choices. By the way, Hamilton also released a smaller version of the watch intended for the ladies. It is about 24 mm at the shorter side with model no. H24211732. Do check it out if you want to get a complement watch for your other half. Mineral Crystal On Top Of The Ventura…. No Sapphire? One of the dissappointment with the watch is the absence of sapphire crystal on top of it. The Hamilton Ventura on has mineral crystal on it, which is not really scratch resistant. What’s perplexing is the high price of the watch (at around $800 to $900 MSRP, but is much lower when bought online i.e Amazon, Ebay etc.) warrants a sapphire crystal on it. Sapphire crystal is the de-facto crystal used on any expensive watches, and at the price point of the Ventura, it’s unthinkable to not have it on the watch. A cost cutting measures from Hamilton? That’s seems to be the case since the higher range of the Ventura model features sapphire on top of it. Powering the Hamilton Ventura is the quartz movement from ETA, the F05.111 caliber. Nothing much can be said about the quartz movement except that it keeps perfect time and can last for 2 to 3 years before needing a battery change. Who Is This Hamilton Ventura Watch For? If you’re looking for something funky, very fashionable and out of ordinary, the Hamilton Ventura is one of the best watches you can get. It’s distinctly designed shield-shaped case will easily turn all eyes over the watch. Not to mention it does look handsome even with this unorthodox case shape for a watch. In addition, the Ventura’s assosiation with Elvis Presley, the King of Rock and Roll, that owned this watch do make it a very attractive watch to be owned by the King’s fans. The edgy design, fits perfectly with Elvis, and that’s something a fan would love to be a part of. Where To Buy Hamilton Ventura? If you love the Hamilton Ventura, consider getting the watch from online retailers such as Amazon. It has the best price with steep discounts compared to the high MSRP of the watch at around $800-$900. On Amazon though, the watch usually retails around the $500-$600 region which is much more make sense to me. Click the link below to check out its latest price. As beautiful and handsome as it is, the Hamilton Ventura is a bit too expensive for a watch. At its price, we are getting a quartz watch with mineral crystal which is a bit too high in my opinion, even by Swiss watch standard. 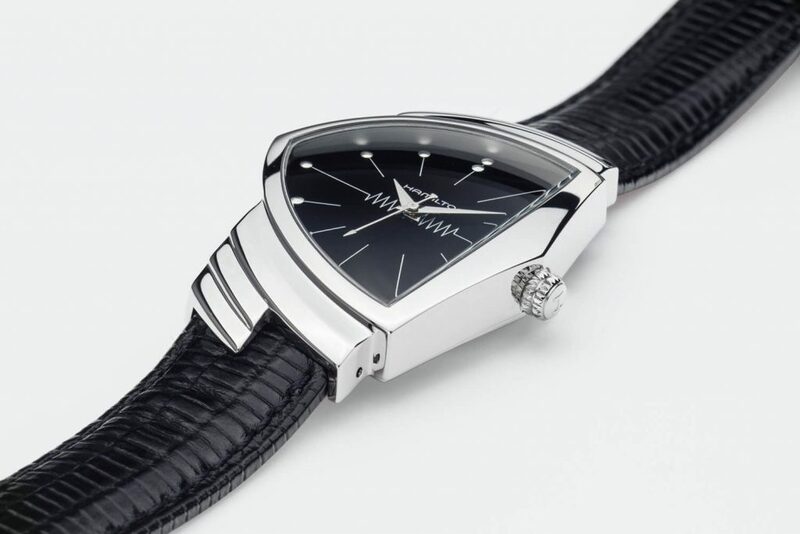 At the price point of $500-$600 (from online retailers), we should be getting an automatic movement WITH sapphire crystal. 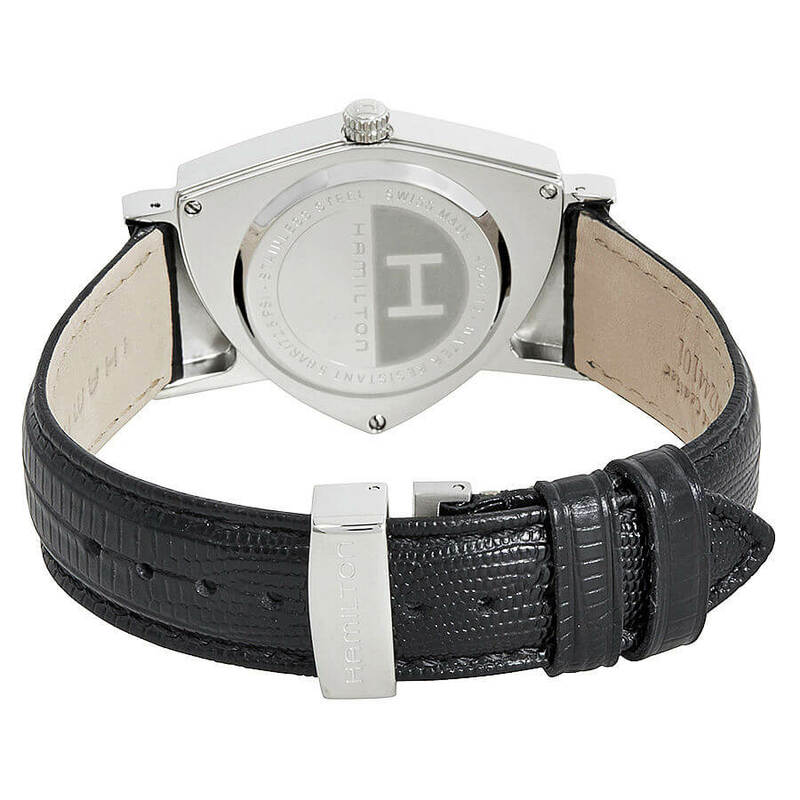 Not to mention that this is a “Hamilton” and not the other more expensive/exclusive Swiss brands. While it does win in terms of aesthetic, this Hamilton Ventura is not really the best watch in terms of value proposition. If you’re looking to get the best value for your hard-earned money, consider the watches in these 2 lists of the best automatic watches of under $1000 to $200 and under $200. The Hamilton Ventura is without a doubt an eye-cacthing watch. With it’s distinctive shield-shaped case, it looks very edgy and handsome – perfect for those looking for a fashionable timepiece. In addition, it’s original version had been worn by Elvis, the King of Rock and Roll previously. That, in itself, is enough to put this watch on a different level than the rest. While the watch is certainly good looking, I find the features to be quite on the lower side, considering the price range that Hamilton is asking for it. Even at the gray online retailers, the watch is still too expensive with the quartz engine and mineral crystal. I hope you’ve enjoyed this Hamilton Ventura review. What do you think about the watch? Let me know in the comments below if you think the watch is something you’d like to own or not. 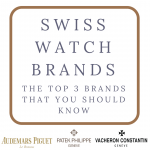 Love your website, it’s a wonderful resource for anyone who is in the market for a watch and doesn’t know what direction to go. The review of the Hamilton Ventura watch is awesome! I have never seen or even heard of this watch and to see it’s uniquely funky and cool is a vast understatement. TBH that is just about the coolest watch I’ve ever seen. The fact that Elvis had one and wore in it that movie just kind of seals the deal. 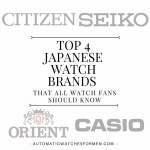 Since you are the watch expert and know a lot about watches I have a question for you. Actually 2 questions. 1. Do you consider the Hamilton Ventura watch worth the money it costs? Probably for someone that really likes the design I’m guessing. 2. What do you think of Rolex watches? Worth the money? Hi Mat. I wouldn’t call myself an expert, but I believe the Ventura is priced a bit too high, considering the specification that it has (it’s a quartz after all…). The design is, without a doubt, one of its kind and very unique which can be the huge selling point for anyone wanting it. Regarding Rolex, it’s on a totally different market and should only be compared against the brands/watches in that price range. One thing for sure, the thousands of people buying Rolex watches every year surely couldn’t be wrong? LOL!